For a man of 'advancing years' (! ), Stuart Lumb (aka Jet Set Super Vet, JSSV) doesn't take the easy option. No pipe and slippers for him, not yet anyway. The Etape Du Dales Sportive is described as "an extremely difficult 112 mile ride and requires an excellent level of fitness". That would be enough to put most people off. Imagine going back to it after you 'failed' three years ago... or just read his great report. Agony and ecstasy indeed. I enjoyed reading Philip Graves' Lanza Ironman blog; was enthralled with his blow-by-blow account especially as he posted a DNF. As an elite athlete (and fellow Yorkshireman) it takes a lot to admit to making mistakes when chatting to mates never mind telling the world on line all about them .So, good on yer Philip and all the best at Wimbleball (that worked!) …my first major lanterne rouge, but as I say we all get a finishers medal, regardless of the time. 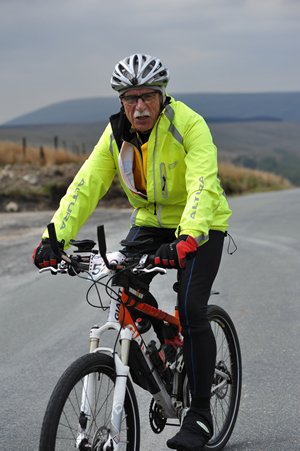 Sportives are the in thing at the moment and I've enjoyed moderate success over the years. The Etape Du Dales is generally reckoned to be one of the toughest on the calendar. It's 110.8miles of steep climbs and descents mainly in NW Yorkshire and probably comes second in toughness after the Fred Whitton. I had attempted the event in 2009 but ended up as a DNF, but unlike Philip didn't tell the world – I chickened out. So I duly signed up again. Easter came and went and I thought I'd better get some training in. I live on the edge of the Yorkshire Wolds which has a few hills but nowt like the Dales. In 2009 I raced on my Motobeccane / Kinesis and ended up pushing it up lots of hills despite having a granny ring, hence I thought I'd compete this year on my Giant Anthem X1 with semi slicks fitted. I also stuck my tribars on as well. I got up to 95miles on a training run two weeks before the event and hoped I'd have enough in t'tank. The Dales weather can be notoriously fickle (I got soaked in 2009) and so I decided to wear full winter gear – gloves, the lot, working on the premise that if it's on you can take it off, but not vice-versa. I carefully re-proofed my leggings, coat and gloves just to be on the safe side, plus I fitted front and rear mudguards on my Anthem. In 2009 I'd driven from home to the start – near Grassington – which is about 80 miles, but this time I splashed out on a B&B in Skipton so that I could start the ride fresh. When I got in my car on the Sunday morning I noticed that most of my side window had suffered bird attack – a huge white blob – which annoyed me initially but I then preferred to think of it as a good luck omen. The day dawned clear and dry – in fact three different forecasts predicted a high of around 12C, very little wind and NO rain….I kept everything crossed and set off for race HQ, arriving about 6.15am. It was showing 6°C on my car thermometer as I unloaded my bike – a bit nippy. I registered, got my timing chip and loaded up. Mrs JSSV had made me some flapjack which went in my back pocket, plus a number of gels and a big bottle of electrolytes. Feeling a bit like a packhorse just starting a trek up the Himalayas I clocked in and off I went. I'd calculated I needed to average just under 10mph to beat all the cut offs – sadly my computer packed in after about 15miles so I just had to peddle like hell! The scenery is stunning if you can afford the time to take it all in. The first major climb takes in Fleet Moss and I'd forgotten how steep those Dales roads are. About 12 Barracudas were riding and they all gradually passed me, one-by-one; not too hard as by this stage I'd stopped and was pushing . One consolation - MTB shoes are much easier to push in than regular bike shoes as I found out quite often during the ride. The Tan Hill stop was heaving and I stood in line to get my much anticipated cup of sweet tea – marvellous! I'd cramped a lot in 2009 so had drunk more this time and refilled my bottle before moving off. The descent from Tan Hill is a long sweeping curve and the sun was just hitting the fellside – no money on earth could buy such a view. Then it was head down to the Moorcock check-point, 69miles out and where JSSV met his Waterloo last time. This year I was about 45minutes inside the limit so was well pleased. The next stretch is the notorious Coal Road, so named because centuries ago before deep mining was developed coal which was quite close to the surface was dug out and taken down by packhorses to the towns for fuel. By this time the field was well strung out and as often is the case I was on my own. Whernside was visable as I pedalled on south and the amazing Ribblehead viaduct. Stainforth is the penultimate checkpoint and a cheery bunch of guys reminded me I had only another 20miles to go, mostly downhill after the initial climb out of Stainforth. 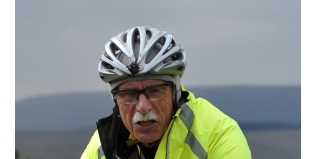 The descent into Halton Gill was very scary as there was gravel on the road plus a nasty right angle blind bend to get round – it was there that I appreciated being on my Anthem with her stop on a sixpence disc brakes, recently serviced by my good friends at Freetown Sports in Hull. Had I come off at that point I'd have appreciated having my Bell helmet atop my bonse, courtesy of DANICO Agriculture, but fortunately I remained vertical and got to Halton Gill still in one piece. Then it was head down, passing the amazing overhanging Kilnsey Cragg on my right. As I headed back to race HQ I could see the rugby posts well above the walls so had something to aim for. The car park suddenly appeared, along with a marshall who dibbed my chip. I fell off my bike and staggered into the clubhouse whereupon a friendly official stuck a little piece of paper into my hand. 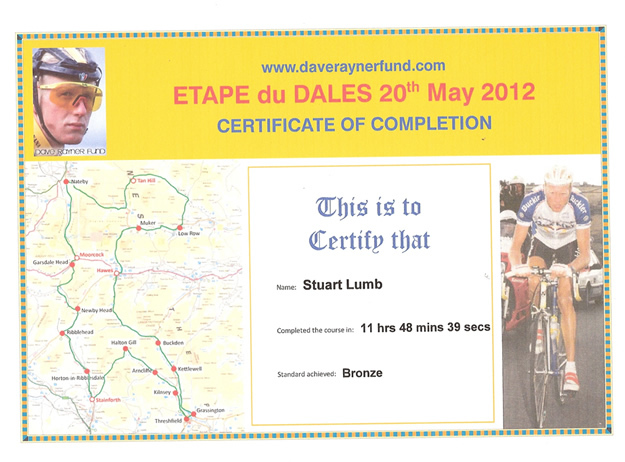 "BRONZE it read - 11hrs 48mins 39secs..No mention of Lanterne Rouge though! With a steaming hot mug of sweet tea in my hand I went back outside to thank the lasses manning the St John's Ambulance who had followed me back from Stainforth, and who had blipped the throttle whenever I started to flag. I'd no problem finding my car as it was the only one left in the car park but did I care – I'd got that particular monkey off my back! An amazing event, fantastic organisation and cheery friendly people.What more can you ask for? Good weather? Well they had fixed that as well. I recently had a mail from the organizer Martyn Bolt asking me "will we see you next year?"